Go to Coronary Artery Atherosclerosis and Noncoronary Atherosclerosis for more information on these topics. Patients with acute coronary syndromes (ACSs) classically present with unstable angina, acute myocardial infarction, or sudden coronary death. In approximately 50-60% of sudden coronary death cases, the culprit lesion exhibits an acute coronary thrombus, whereas the remainder of these cases include stable coronary plaques with greater than 75% cross-sectional area luminal narrowing. It is now recognized that the preexisting thin cap fibroatheroma (TCFA) (vulnerable plaque) in approximately 50% of patients dying from sudden thrombotic occlusion occurs as a hemodynamically insignificant lesion. The onset of symptoms and life-threatening complications therefore depend not only on the severity of narrowing in stable chronic anatomic disease but also on critical dynamic morphologicchanges in coronary plaque in the arterial wall. Sudden luminal thrombosis may arise from 3 different plaque morphologies: plaque rupture, erosion, and calcified nodule. Of these 3, plaque rupture is the most frequent, accounting for 60-75% of cases. The incidence of plaque rupture varies with each decade of life, and the highest incidence of rupture is seen in the 40s in men, whereas in women the incidence increases beyond age 50 years. Plaque rupture is a more frequent cause of coronary thrombosis in men than in women, and there is a strong association with circulating total cholesterol. The incidence of rupture beyond 50 years is similar for both sexes. Plaque erosion is defined as an acute thrombus in direct contact with the intima in an area of denuded endothelium. Histologically, luminal thrombus is present with an underlying base rich in proteoglycans and smooth muscle cells with minimal inflammation. Most erosions lack a necrotic core but when present, a thick fibrous cap sequesters the necrotic core, preventing communication with the lumen. In addition, eroded lesions tend to be eccentric and are rarely calcified. These plaques account for 25-40% of all coronary thrombi in sudden coronary death (see the following image). Case study: Plaque erosion in a 33-year-old female. The patient complained of chest pain for 2 weeks and was discharged form the emergency department with a diagnosis of anxiety. A: The left anterior descending coronary artery contains a luminal thrombus (Th) with >80% cross-sectional luminal narrowing by atherosclerotic plaque. The underlying lesion shows a necrotic core (NC) consistent with a fibroatheroma (Movat actin positive smooth; pentachrome, × 20). B: The eroded surface contains muscle cells (smooth muscle cells [SMCs]) (×200). C: Macrophages. D: T cells. E and F: Platelet (PLT) (anti-CD61) and fibrin (anti-fibrin II) staining show partial organization of the thrombus (×100). Plaque erosion occurs primarily in patients younger than age 50 years and represents the majority of acute coronary thrombi in premenopausal women, especially women with a history of tobacco use. Approximately, 20-25% of acute myocardial infarctions occurring in hospitalized patients are due to plaque erosion, and the relative proportion of erosions (compared with plaque rupture) is higher in women than men. The calcified nodule is the least common cause of coronary thrombosis (2-7%). These lesions typically contain a calcified plate with superimposed calcified nodules that result in discontinuity of the fibrous cap. The luminal thrombus is in direct contact with calcium nodules in areas devoid of endothelial cells (see the image below). Calcified nodule. A: There is an eccentric plaque that does not result in critical stenosis; it is largely composed of calcium. B: A higher magnification of disrupted calcium nodules and fibrin resulting in extrusion into the lumen (Burke et al. Herz. 2001;26:239-44, with permission). 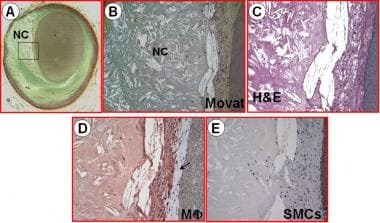 Morphologic studies have identified coronary lesions that share many histologic similarities with plaque rupture and are therefore hypothesized to be the precursor lesion of plaque rupture. Those precursor plaques that closely resemble ruptures but lack a luminal thrombus have been characterized as thin-cap fibroatheromas (TCFAs), or vulnerable plaques. As previously described, plaque ruptures are characterized by a necrotic core with an overlying thin-ruptured fibrous cap infiltrated by macrophages and lymphocytes. The thickness of the cap near the rupture site measures 23 ± 19 µm, with 95% of the caps measuring < 65 µm. The TCFA, like the rupture, demonstrates a necrotic core with an overlying fibrous cap (measuring less than 65 µm in thickness) but lacks a thrombus (see the following image). A nonhemodynamically limiting thin-cap fibroatheroma (TCFA). A TCFA having a necrotic core (NC) and an overlying thin fibrous cap (&lt; 65 µm) is shown in A and B, with a high-power view of the boxed area in A. Note that an advanced necrotic core with a large number of cholesterol clefts with surrounding loss of matrix and no cellular infiltration is seen. The fibrous cap is infiltrated by macrophages, better seen in C when stained by hematoxylin and eosin (H&E). D and E show macrophage infiltration (CD68+) and rare actin positive staining in the fibrous cap. (Kolodgie-Alpha staining of smooth muscle cells). Kolodgie et al. Heart. 2004; 90:1385-91, with permission). Despite many similarities, several morphologic features distinguish the TCFA from the ruptured plaque. For example, TCFAs demonstrate a smaller necrotic core, fewer macrophages infiltrating the fibrous cap, and significantly less calcification. Other plaque features have been analyzed and compared for these 2 lesions as well as erosions and stable plaques. Overall, cross-sectional luminal narrowing is greater in ruptures than TCFAs, with occlusive thrombi having greater underlying stenosis than nonocclusive thrombi. The number of cholesterol clefts in the necrotic core, vasa vasorum, and macrophages are significantly greater in ruptures than erosions or stenotic stable lesions. The necrotic core and its enlargement are critical for plaque rupture. 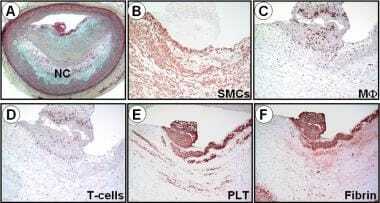 It has been shown that macrophage infiltration is the first step toward the eventual formation of an atherosclerotic plaque. In vitro studies have shown that low-density lipoprotein (LDL) oxidation facilitates its uptake by macrophages. This 2-step process begins with oxidation of lipid, followed by apolipoprotein B oxidation. Foamy macrophages contain cholesterol esters and free cholesterol. However, as the plaque progresses, the free cholesterol content of the lesion increases, whereas the cholesterol esters decrease. Intraplaque hemorrhage may also be an important contributor to expansion of the necrotic core. [9, 10] Hemorrhage into the atheroma may occur through leaky vasa vasorum and the subsequent accumulation of free cholesterol derived from erythrocyte membranes. Interestingly, the cholesterol content of erythrocyte membranes exceeds that of all other cells in the body, with lipid constituting 40% of the weight. The majority of thin-cap fibroatheromas (TCFAs) (vulnerable plaques), acute ruptures, and healed ruptures are concentrated in the proximal portion of the 3 major coronary arteries and another 50% arise in the mid-portion of these arteries (see the image below). These lesions are few in the distal coronary circulation. By far, the most frequent location is the proximal portion of the left anterior descending coronary artery; sites in the proximal left circumflex and mid to proximal right coronary arteries are about one half as common. 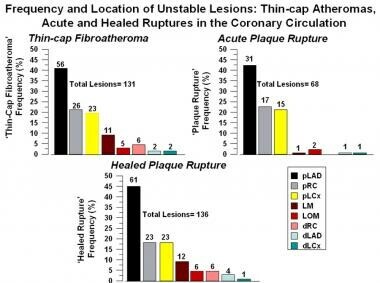 Frequency and location of unstable lesions, such as the thin-cap atheromas and acute and healed plaque ruptures in the coronary circulation (Kolodgie et al. Curr Opin Card. 2001;16:285, with permission). dLAD = distal left anterior descending; dLCx = distal left circumflex artery; dRC = distal right coronary; LM = left main artery; LOM = left obtuse marginal artery; pLAD = proximal left anterior descending coronary artery; pLCx = proximal left circumflex artery; pRC = proximal right coronary artery. The extent of luminal narrowing varies with lesion morphology. Fibroatheromas have the least luminal narrowing, whereas lesions with acute plaque rupture, hemorrhage, or healed repair sites show the most stenosis. The vast majority of TCFAs (>80%) have less than 75% cross-sectional area luminal narrowing (equivalent to < 50% diameter stenosis). During plaque development, outward remodeling of the artery occurs, essentially negating the flow-limiting potential when plaques occupy < 40% cross-sectional area luminal narrowing. TCFAs are associated with positive remodeling and therefore may show minimal luminal narrowing by angiography. Pathologic studies have demonstrated that inflammation contributes to the acute thrombotic complications of atherosclerosis. For example, it has been shown that fibrous cap thickness is related to the extent of macrophage infiltrate. Thin fibrous caps tend to demonstrate a greater number of macrophages compared with thick fibrous caps. Macrophages produce matrix metalloproteinases (MMPs), zinc-dependent endopeptidases, that possess catalytic activity. Much interest has been focused on the role of MMPs as the main cause of fibrous cap disruption in plaque rupture. Fibrillar collagens, especially type I, provide most of the tensile strength to the fibrous cap. The initial proteolytic nick in the collagen chain is provided by MMPs-1, -8 and -13, whereas the gelatinases MMP-2 and MMP-9 support collagen breakdown. It has been shown that atheromatous rather than fibrous plaques preferentially exhibit type I collagen cleavage occurring at sites that are rich in macrophages expressing both MMP-1 and MMP-13. Clinical studies of coronary artery disease have shown that increased circulating levels of C-reactive protein (CRP), a positive acute-phase reactant, are an independent risk factor for cardiovascular disease. Pathologic studies have shown that the median serum CRP is significantly higher in victims of sudden coronary death dying from plaque rupture, erosion, and stable plaque relative to control subjects dying of noncoronary conditions. 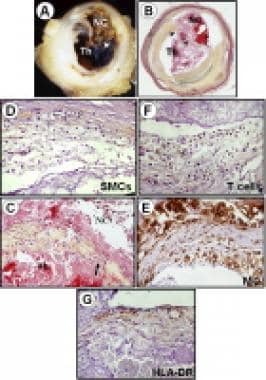 In addition, there has been considerable interest in the role of other inflammatory proteins such as pregnancy-associated plasma protein-A, interleukin (IL)-6, IL-12, and oxidative products that may reflect the presence of chronic inflammation in the arterial wall or elsewhere in the body and thus may increase the risk of atherosclerosis. Kolodgie FD, Burke AP, Farb A, et al. The thin-cap fibroatheroma: a type of vulnerable plaque: the major precursor lesion to acute coronary syndromes. Curr Opin Cardiol. 2001 Sep. 16(5):285-92. [Medline]. Virmani R, Kolodgie FD, Burke AP, Farb A, Schwartz SM. Lessons from sudden coronary death: a comprehensive morphological classification scheme for atherosclerotic lesions. Arterioscler Thromb Vasc Biol. 2000 May. 20(5):1262-75. [Medline]. Hansson GK, Libby P, Tabas I. Inflammation and plaque vulnerability. J Intern Med. 2015 Nov. 278(5):483-93. [Medline]. Giesen PL, Rauch U, Bohrmann B, et al. Blood-borne tissue factor: another view of thrombosis. Proc Natl Acad Sci U S A. 1999 Mar 2. 96(5):2311-5. [Medline]. [Full Text]. Farb A, Burke AP, Tang AL, et al. Coronary plaque erosion without rupture into a lipid core. A frequent cause of coronary thrombosis in sudden coronary death. Circulation. 1996 Apr 1. 93(7):1354-63. [Medline]. Niccoli G, Cin D, Scalone G, et al. Lipoprotein (a) is related to coronary atherosclerotic burden and a vulnerable plaque phenotype in angiographically obstructive coronary artery disease. Atherosclerosis. 2016 Mar. 246:214-20. [Medline]. Kolodgie FD, Gold HK, Burke AP, et al. Intraplaque hemorrhage and progression of coronary atheroma. N Engl J Med. 2003 Dec 11. 349(24):2316-25. [Medline]. Haider N, Hartung D, Fujimoto S, et al. Dual molecular imaging for targeting metalloproteinase activity and apoptosis in atherosclerosis: molecular imaging facilitates understanding of pathogenesis. J Nucl Cardiol. 2009 Sep-Oct. 16(5):753-62. [Medline]. van Dijk RA, Duinisveld AJ, Schaapherder AF, et al. A change in inflammatory footprint precedes plaque instability: a systematic evaluation of cellular aspects of the adaptive immune response in human atherosclerosis. J Am Heart Assoc. 2015 Mar 26. 4(4):[Medline]. [Full Text]. The authors and editors of Medscape Reference gratefully acknowledge the contributions of Andrew Farb, MD, and Frank Kolodgie, PhD, to the development and writing of this article.